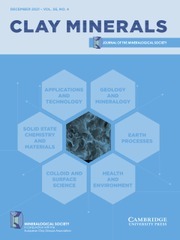 Clay Minerals is an international journal of mineral sciences, published four times a year, including research papers about clays, clay minerals and related materials, natural or synthetic. The journal includes papers on Earth processes, soil science, geology/mineralogy, chemistry/material science, colloid/surface science, applied science and technology and health/ environment topics. The journal has an international editorial board with members from fifteen countries.